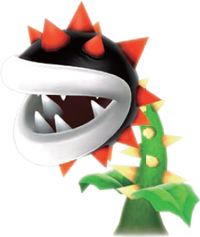 Not to be confused with Spiny Piranha Plant. Prickly Piranha Plant in Sky Station Galaxy. The Prickly Piranha Plant, also known as the Spiky Piranha Plant, is a variety of Spiny Piranha Plant that appears in Super Mario Galaxy 2. The Prickly Piranha Plant attacks in the same way as its purple counterpart: slamming its head onto the ground. The player cannot jump on it due to its spikes and must use the nearby rubbery bulb to defeat it by hitting its head when it is down on the ground. In Sky Station Galaxy during the Storming the Sky Fleet mission, this enemy holds a key to the locked up Power Star nearby and must be defeated. In Throwback Galaxy, another can be found near the elevator. In Super Smash Bros. Ultimate, Piranha Plant becomes a small Prickly Piranha Plant for its side smash attack. In Palutena's Temple, Prickly Piranha Plants (just called Prickly Piranhas) are mentioned briefly by Viridi during Palutena's Guidance dialogue for Piranha Plant. ↑ Browne, Catherine. Super Mario Galaxy 2 PRIMA Official Game Guide. Pages 29, 40 and 42. ↑ Browne, Catherine. Super Mario Galaxy 2 PRIMA Official Game Guide. Pages 222 and 225. This page was last edited on March 4, 2019, at 14:10.